Without naming Congress president Rahul Gandhi, Shivraj Singh Chauhan said, "Some time ago a Congress leader came to Mandsaur, but he hardly knows how chilli grows on the plant and has no idea whether onion grows above the ground or below it." 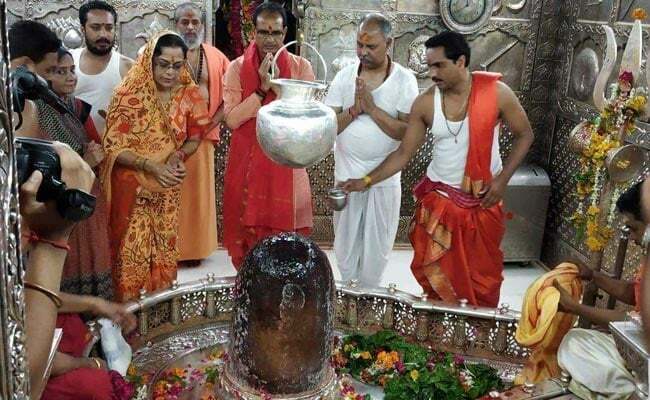 With an eye on assembly polls in Madhya Pradesh, Chief Minister Shivraj Singh Chouhan began his "Jan Ashirwad Yatra" from the holy city of Ujjain today. The yatra was flagged off by BJP president Amit Shah. Before embarking on his journey, Mr Chauhan offered prayers at Ujjain's Mahakal temple. The purpose of this yatra is to connect with voters in all 230 assembly segments of the state before elections, but from the stage, the BJP president and the chief minister targeted main opposition Congress. Amit Shah said "Congress leaders are dreaming about forming a government in MP, but they don't know two 'rajas' (Jyotiraditya Scindia and Digvijaya Singh) and one 'dhanpati' (Kamal Nath) can't form the government, only a farmer's son (Chouhan) would form the next government." Mr Chouhan will address as many as 700 public rallies highlighting the achievements of his government. Meanwhile, Madhya Pradesh Congress chief Kamal Nath sent a letter to the Mahakaleshwar Temple to seek his blessings. Party secretary Sajjan Singh Verma said, "Today, the public is ready to take revenge. Hon'ble Kamal Nath has written a letter to Mahakaal that how the government is fooling the people of MP, how the state is suffering with farmers suicide, minors are being raped. Lord Mahakal will teach them a lesson." The Congress says it will start a Jan Jagaran Abhiyan Yatra to expose the series of failures of the Shivraj Singh Chouhan government. The Abhiyan will be flagged off by Kamal Nath on July 18 from Tarana town in Ujjain district.